Maternity clothes? Ebay is a great source! Stretch marks? Nope- thank goodness! That line is getting more visible though! Sleep: ughhh this is the most annoying part- literally back will be fine all day and I'll make myself active on purpose but the minute I get in bed and have to go on my dreaded side it acts up! I'm thinking its our mushy feather mattress. I'm going to strip it off tonight and sleep on the firmer side and see what happens. Best moment this week: Seeing her move and dance all day is the absolute best. She is still SO active and I'm soaking it all up since she's steadily getting bigger and will have less space to move around. Nursery: Walls are Valspar Mint Mist, Trim is white, tall dresser is in and crib + crib mattress in and set up! 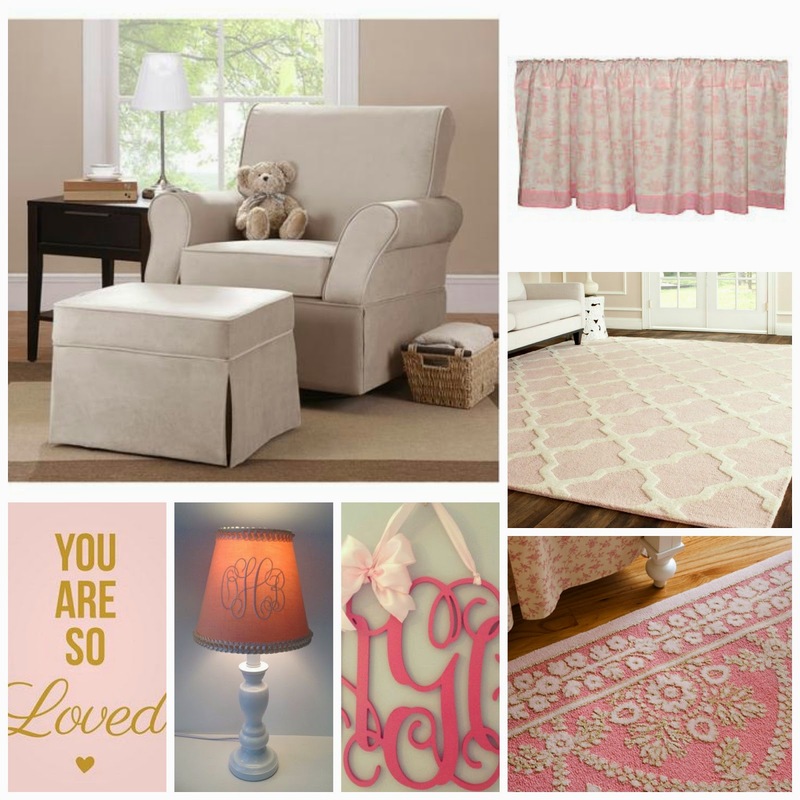 Looking to order glider, bookshelf, pink rug and custom valances and then accessories! SO much fun! Workouts: Got one walk in with Emma and still doing weights! Looking forward to: More nursery progress! The nursery picks are perfect! It's gonna look great with the light green walls! 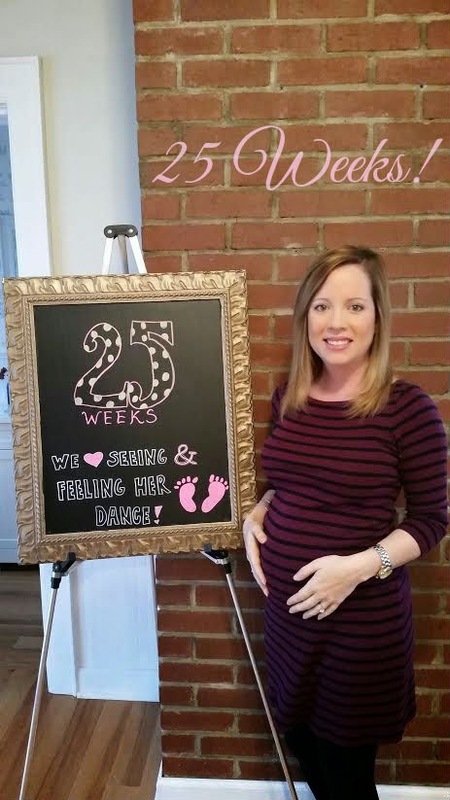 Love your cute little maternity dress! How exciting that she's moving around all the time--I bet it's amazing to experience :) Love you, girl!! Ugh, hope your sleep gets better. That's so annoying, isn't it? Love all of the nursery inspiration, pink pink and more PINK!!!!! You look amazing girl! Sorry you aren't getting much sleep, I hope that gets better for you but I guess the closer you get the less like that is, huh? Loving all the nursery stuff! So adorable! Looking good my friend <3 Not sleeping well seems to be a pattern I'm seeing, that stinks! Love seeing your bump get bigger & I can't wait for more pics of the nursery! Looking good mama!! Love all the nursery inspiration pics!! Hope the sleeping thing gets better. It's hit and miss for me too, so I know it's no fun! Still look so flippin' cute! And I can't wait to see pics of the nursery. It's going to be fabulous! Funny you're craving mango! I love mango preserves on a turkey sandwich (try it asap!). Cannot wait to see how the nursery turns out!! Glad you're doing so well! Ah love the bump!! You think its big now... just wait another 10 weeks! :) I hope you're able to get comfy sleeping, it gets tough towards the end. Are you using a pregnancy pillow? I think it helps a lot to have a pillow supporting the bump, especially as you get bigger (unsolicited advice.. haha). Can't wait to see the nursery, its going to be adorable! I'm sorry you're having g such a terrible time sleeping! The wedge we purchased a couple weeks ago + about 6 pillows has been my lifesaver & gotten me off the couch/back in my bed! We bought it at Walmart for like $20 I think. There came a point where I couldn't sleep on my side anymore bc of the weight I had gained & it just pulled on my back muscles, that's why I moved to the recliner so I could "lay on my back". The wedge helps prop me up like being in the recliner, if that makes sense! Hope this might help!? Your are just the cutest pregnant lady! Love your weekly updates Jessi! You are so adorable, and I LOVE that chalkboard. Looks like little miss is going to have a super cute nursery!